1. The violent nature of the flotilla and the events on board the Turkish ship Mavi Marmara should not have come as a surprise if anyone would have "connected the dots" before the takeover of the ship by the Israeli navy seals. 2. The Gaza flotilla initiative was a step in the implementation of the Jihadi "Istanbul declaration", which was issued at a conference held in Istanbul on 14-15 February 2009 under the title, "Gaza victory". Around 200 Arab and European Sunni sheikhs and clerics, as well as members of Hamas attended the conference – 90 of them signed the declaration (see appendix). According to a BBC reporter who attended the event, "speaker after speaker called for jihad against Israel in support of Hamas". The Istanbul declaration set the ideological Jihadi confrontational violent formula for future materialization of its decisions, as demonstrated in the events of the flotilla to Gaza. The Gaza Flotilla initiative must be linked and understood within the radical pan-Islamic context and the mindset as reflected by its initiators in light of the Istanbul declaration and the 90 radical Muslim scholars and clerics from around the world who publicly sanctioned the legitimacy and support of Hamas and its military actions. 3. The Jihadi Istanbul Declaration affirmed "The obligation of the Islamic Nation to find a fair formula of reconciliation between the sons of the Palestinian people, under whose responsibility a legitimate authority will be formed that will attend to the fixed norms and the legitimate and national rights; and will carry on with the jihad and Resistance against the occupier until the liberation of all Palestine.” It also affirmed "The obligation of the Islamic Nation to open the crossings -- all crossings -- in and out of Palestine permanently, in order to allow access to all the needs of the Palestinians -- money, clothing, food, medicine, weapons and other essentials, so that they are able to live and perform the jihad in the way of Allah Almighty.” Additional affirmation has noted that: "We affirm that the victory that Allah accomplished by means of our brothers the Mujahidin, our defiant and steadfast kinsfolk in Gaza, was indeed achieved through His favor and help - exalted be He! It was also achieved through fulfilling the religious obligation of jihad in His way." 4. According to the Istanbul declaration, there is an obligation for "the Islamic Nation to regard the sending of foreign warships into Muslim waters, claiming to control the borders and prevent the smuggling of arms to Gaza, as a declaration of war, a new occupation, sinful aggression, and a clear violation of the sovereignty of the Nation". It continues: "This must be rejected and fought by all means and ways." Several participants on board the violent ship Mavi Marmara were identified as participants and signatories of the Jihadi Istanbul declaration and their personal involvement in the flotilla demonstrates their commitment to the Jihadi cause by posing themselves as a leading model. Muhammad Kazem Sawalha - one of the flotilla's organizers (Sawalha did not personally paticipate in the flotilla), and formerly a high-ranking fHamas commander of the Iz A-Din Al Qassam Brigades residing and active in the UK, appears in the signatory list at number 72. It is worth mentioning a statement made by Muhammad Sawalha, the senior Hamas operative in Britain who was involved in launching the previous aid flotilla (“Lifeline 3”). According to Sawalha’s statement, the next aid convoy will avoid an “unwanted confrontation” with the Egyptian authorities, which happened last time. Next time, said Sawalha, “the confrontation will be directly with the Zionist enemy itself on the high seas” (Al-Intiqad, Hezbollah’s website, January 17, 2010). Walid Al-Tabtabai - prominent flotilla activist from Kuwait who appears as a signatory on the Istanbul declaration (number 88) is known to support armed resistance in Palestine and in Iraq. At a press conference in Antalya, Turkey, the flotilla organizers asked all the participants to "write their wills." Following the press conference, Walid Al-Tabtabai reportedly "did not hesitate to write his will, in defiance of the Israeli threats". Sheikh Muhammad al-Hazimi, appears as a signatory on the Istanbul Declaration (number 66), a member of the Yemeni Parliament and of Al-Islah (the Yemini reform bloc), was photographed on the deck of the Mavi Marmara brandishing his large, curved dagger. The Arab-Israeli Sheikh Ra'ed Salah, head of the northern branch of the Islamic Movement in Israel, is a radical Islamist whose participation in the flotilla on board the Mavi Marmara was no coincidence. 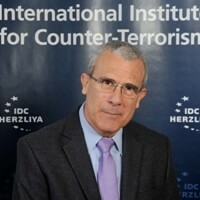 He is one of the founders and a board member of the Union of Good and he maintains close ties with the Hamas leadership and supports its activities through material support and past funding to Hamas charitable organizations in the West Bank. The Yemeni Al Islah party sent three members to participate in the flotilla on board the violent ship. The Islah party runs the radical Islamic Al Islah charitable organization is also part of the Union of Good and known to be committed to the Jihad struggle of Hamas and is designated by Israel and the USA. It should be noted that the Yemeni Al Islah organization is lead by sheikh Abd Al Majid Zindani, a radical Islamist linked to Al Qaeda and Bin Laden, designated by the USA in 1995 as a terrorist, accused in 2004 of supplying weapons to al Qaeda and is known to be linked and involved in the preparations of Omar Farouk Abdulmutallab, the Christmas 2009 Detroit failed airline bombing attempt. In a retrospective analysis, which is based on open-source material, some of which had been published prior to the flotilla’s violent events, one can conclude with a high degree of certainty that the Union of Good, as a radical Islamic umbrella worldwide coalition of Islamic charities, was assigned to carry out and implement the Istanbul declaration's action items to break the Israeli siege on Gaza. The Muslim Brotherhood spiritual leader Sheikh Yusuf al-Qardawi who sanctioned in 2002 the legitimacy of suicide bombings against Israeli civilians, as well as numerous notorious and hateful Fatwas against Israel and the Jews, runs this collection of charities. The Union of Good was outlawed by Israel and is a designated entity by the U.S. Treasury Department due to its fund-raising activities on behalf of Hamas and the Hamas-controlled front charitable organizations in the West Bank and Gaza. The Union of Good has an international web of connections in the Arab and the Islamic world, as well as in Muslim communities in the West, which enables it to set the logistic infrastructure, funds and recruits in a relatively short period of time. The Turkish IHH which, is part of the Union of Good, was set as the leading, prominent organization among the coalition organizations participating in the aid flotilla scheduled to arrive in the Gaza Strip. The Turkish IHH (Insani Yardim Vakfi, IHH, “humanitarian relief fund”) is known to be a radical Islamic organization, which was established in 1992 and formally registered in Istanbul in 1995. The IHH (outlawed by Israel in 2008) is part of the Union of Good, and seems to have been chosen to lead the Jihadi violent flotilla to Gaza. The Arab-Israeli Sheikh Ra'ed Salah’s participation in the flotilla on board the Mavi Marmara was no coincidence. He is one of the founders and a board member of the Union of Good and he maintains close ties with the Hamas leadership and supports its activities through material support and past funding to Hamas charitable organizations in the West Bank. The Yemeni Al Islah party, which sent three members to participate in the flotilla on board the violent ship, runs the radical Islamic Al Islah charitable organization, which is also a member organization within the Union of Good and known to be committed to the Jihad struggle of Hamas and designated by Israel and the USA. Organizing the flotilla to Gaza necessitated a long series of preparations and a vast mobilization system which maintained contact with hundreds of organizations and operatives around the globe, most of them affiliated with radical Islam and the Muslim Brotherhood, and some of them pro-Palestinian from Western relief organizations. One can not rule out the possibility of the Union of Good, as a pan-Islamic organization with some of its associated members having participated in the Istanbul conference and the Union of Good as a pan-Islamic pro-Hamas umbrella organization, were commissioned and designated to serve as a platform had presumably supported the logistic preparations and mobilized recruits. (And now to our topic). This statement is addressed to the Islamic Nation, its religious scholars, its rulers and its peoples. In it we congratulate the whole family of Islam on the manifest victory which Allah has granted us in the land of Gaza, a land of pride and dignity, over the Zionist Jewish occupiers. Allah has appointed it as the first step in the complete victory for all of Palestine and the holy places of the Muslims. Furthermore, we herein emphatically affirm various resolutions and judgments. 2. We affirm that this manifest victory has clearly disclosed the volume of international and local military and political conspiracy against the jihad and the mujahidin in Gaza, as represented by the following: • Military co-operation in tightening the blockade and closing the crossings to the people of Gaza, especially the Rafah crossing. • Public or quasi-public support for the enemy. • The prevention of demonstrations and popular events held in support of the mujahidin; the arrest, trial and severe punishments of those who instigate them. • The aggressive pressure put on the mujahidin to break their will and force them to agree to their [the conspirators] terms and the stipulations of the Zionist enemy. • The attempt to present the Hamas government as the cause of this malicious Jewish Zionist war over Gaza. • The absence of any official and effective Arab and Islamic stance and its weakness in reflecting the will of the Arab and Islamic peoples to help our brothers in Gaza win. This indicates the width of the gap between the Nation and those rulers who lead it. • The use of funds for reconstruction and aid to those hurt as a negative pressure card on the mujahidin to abandon their legitimate demands, or some of them. • The prevention of delivery of aid and reconstruction funds to the Hamas government and the reliable authorities in Gaza; deeming the Palestinian Authority, represented by the presidency of Abbas and the Fayyad government, the sole representative of the Palestinian people, without the Hamas government; and the delivery of such funds and aid to increase their grip on the legitimate elected government of Hamas. This redoubles the suffering of the people of Gaza at the time they mostly need those funds and aid. 3. We affirm in full conviction that the Palestinian Authority, whose mandate is coming to an end, is not eligible to represent the Palestinian people. It stands outside the will of its people, and has given up the choice of jihad in the way of Allah Almighty as an effective means in defeating the occupation and the liberation of the Islamic holy places. It adopts the wishes of the Nation’s enemies in exchange for the illusions of false peace. 4. We affirm in full conviction that the so-called Arab peace initiative is a proven betrayal of the Islamic Nation and the Palestinian cause, and a blatant betrayal of the Palestinian people. It aims to criminalise the Resistance [muqawama] against the Zionist occupying entity in perpetuity through its de facto recognition of it, as well as the confiscation of the right of refugees to return to their homes and their property. 1. The obligation of the Islamic Nation to rush to the aid of the people in Gaza; to rebuild what the Zionist aggression destroyed; to compensate the injured and support the widows, orphans, those suffering permanent disabilities, and the old and infirm. 2. The obligation of the Islamic Nation to restrict itself to dealing only with the legitimate elected Palestinian government (Hamas) in the delivery of aid and reconstruction of dwellings. It is the sole government authorised to do that by reason of its official legitimacy as well as its maintaining the Resistance against the Jewish Zionist occupation, its integrity, and its solidarity with the people in all circumstances. 3. The obligation of the Islamic Nation not to recognise the Palestinian Authority, whose mandate is ending, as representative of the Palestinian people. It must not elect it again, in view of its proven financial and administrative corruption as well as its squandering of time and assets behind the false peace process. It is also necessary to work seriously to choose a new authority that will guard the Palestinian ranks, respect their will and their right to resist the occupation, and work for the complete liberation of its land and holy places. 4. The obligation of the Islamic Nation to circulate a declaration to withhold aid funds from the undeserving or placing them in the hands of those who are not trustworthy. It must regard this as a legal betrayal that should be prosecuted, and punish those who cause mayhem, negligence and waste of these moneys. 5. The obligation of the Islamic Nation to find a fair formula of reconciliation between the sons of the Palestinian people, under whose responsibility a legitimate authority will be formed that will attend to the fixed norms and the legitimate and national rights; and will carry on with the jihad and Resistance against the occupier until the liberation of all Palestine. 6. The obligation of the Islamic Nation to open the crossings -- all crossings -- in and out of Palestine permanently, in order to allow access to all the needs of the Palestinians -- money, clothing, food, medicine, weapons and other essentials, so that they are able to live and perform the jihad in the way of Allah Almighty. The closure of the crossings or the prevention of the entry of weapons through them should be regarded as high treason in the Islamic Nation, and clear support for the Zionist enemy. 8. The obligation of the Islamic Nation to regard the sending of foreign warships into Muslim waters, claiming to control the borders and prevent the smuggling of arms to Gaza, as a declaration of war, a new occupation, sinful aggression, and a clear violation of the sovereignty of the Nation. This must be rejected and fought by all means and ways. To conclude: the Nation’s scholars and proselytisers remind the Islamic Nation, rulers and ruled alike, of the necessity of returning to its religion, adhering to the book of its Lord and the sunna of his Prophet, working for its unity, and seizing control of the instruments of power that will make possible its supremacy and the preservation of its holy places and provisions ‘Allah prevails in his purpose, but most people know not.’ [Quran, 12: 21]). One of the signatories of the Jihadi Istanbul Declaration. Al-Rai (Kuwait), May 30, 2010. Sentenced by Israeli court to 3.5 years in prison.